A devastating earthquake hits New York City, with survivors left fighting for their lives amongst the ruins. A volcano in Yellowstone Park suddenly erupts. A massive earthquake creates a chain of events that threaten two of the largest nuclear reactors. An untested global defence system triggers a swarm of devastating solar flares, resulting in catastrophic earthquakes and ferocious magnetic storms; an unprecedented CAT. 8 Armageddon. Can we stop the annihilation of the human race? Charlie Price, a former scientist turned science fiction author, starts living one of his novels when the Federal Science Foundation's weather experiments escape control and turn disastrous. Two episode television mini-series covering a meteor, Kassandra, heading to Earth on a collision course, an "extinction level event". A meteorite brings ice and freezing temperatures, which threatens to harm the residents of a small town at Christmas. Jim, Secretary of Homeland Security: Just my luck - I'm not dead. Ok first the good. The opening scene is cool. I mean, who doesn't want to see a pair of douchebaggy soccer fans get whipped against the Eiffel Tower like a couple of rag dolls? Who doesn't want to see a bunch of snotty French politicians get eaten by a 20ft laughing clown head? Who doesn't want to see the Eiffel Tower twisting around like that 90s dancing baby gif? 10 minutes into the flick I was on my 2nd bucket of popcorn. 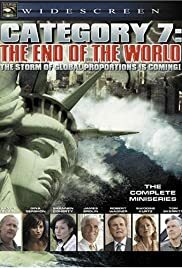 Next we get a surprisingly sober initiation to the basic plot, which is even more surprisingly credible and quite prophetic, given the fact that the 2005 writers predicted the 2017 Trump Administration's reversal of all environmental safeguards (so we can all keep our jobs as coal miners). 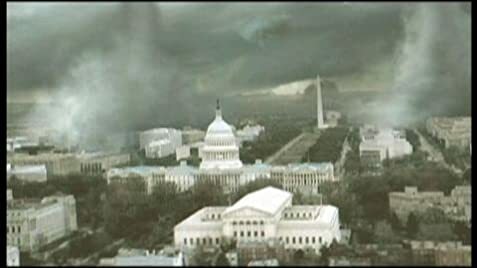 The film's premise is just as much political intrigue as it is mayhem flick: corrupt politicians bury years of environmental science warning us of doomsday, until one day it reaches critical mass and we get an apocalyptic wave of storms (not unlike the ones we had 6 months ago but with more murderous clown heads). Gina Gershon makes a believable entrance as the new head of FEMA appointed mostly because the government needed a hot babe to do PR for the news cameras. She enters with an air of polite authority, yes a babe but intelligent and in control, actually a really good hero figure, dressed in a cool, conservative suit that makes the world as well as the audience take her seriously. Oh but pay close attention to her wardrobe as the plot peels away (pun intended). Yes I have graphed a direct, scientific correlation between Gina Gershon's plunging neck line and the plunging credibility of this flick. As it gets lower & lower, as costume choices get tighter & tighter, as buttons come unbuttonier & unbuttonier--to the point where I was waiting for Gina to yell at the cameraman "Hey my eyes are up here!" --the plot turns into a serious case of WTF. The timeline gets compressed harder than Gina's cleavage, where one minute you'll have someone getting killed in a raging tsunami and, literally, the next scene is that person's funeral in the warm glow of sunlight, then back to panicked storm chasing, some random terrorists, a perfect marriage falling apart, politicians getting attacked by murderous frogs, and a totally bizarre plot element about a guy getting his arm stuck in a pipe 200ft up in the air while trying to fix the motherboard on his computer. Did I miss anything? Probably. Because I was too damn distracted by Gina Gershon's neckline which is now down to her ankles. Also I was distracted, to the point of epileptic seizures, by the hyper stylized, rapid fire, plain bizarre edits in the film which in 20 years will either be hailed as the greatest cinematic innovation since film noir, or just plain stupid. But omg if you hadn't guessed, this movie is anything but boring. I mean, who doesn't want to see a trailer park get sucked into the sky as its residents scramble to rescue the plastic pink flamingoes from their doorsteps? Who doesn't want to see Tom Skerritt (Commander Dallas from the iconic scifi thriller "Alien") flying loop-de-loops in a $33 million SR-71 Blackbird... to save the world, you say? ...no, just to collect data which could've been more easily received by a weather satellite, except that weather satellites don't have the great Tom Skerritt flying loop-de-loops in them. Who doesn't want to see the great James Brolin (the dashing hero of "Capricorn One") doing the electric slide from the pulpit of a tv ministry? Who doesn't want to see, omg the best part, Randy Quaid playing the deathwish storm chaser from, I dunno Arkansas by the sound of his accent, basically a reprise of his hilarious role as the Winnebago guy in "Christmas Vacation"? So there you have it, this movie has everything. Sort of like a pineapple anchovy m&m pizza has everything. I don't know whether to rate this flick a zero or a gobjillion.